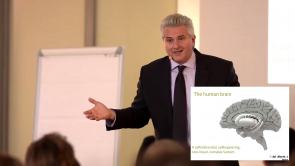 David Grand describes the central aspects of brainspotting and performs a live demo. Dr. Dr. Damir del Monte presents new insights into how our brain works and how neuroscientists describe the effects of psychotherapy. Together they discuss how brainspotting might work. An exciting dialogue and a "must have" for all brainspotting therapists.